7 Nights from £859 inc Flights, Hotel & VIP Transfers - £412 OFF! Merit Crystal Cove Hotel is one of the most striking hotels in Northern Cyprus, with both sea and mountain views, and an exceptional quality of service at this top North Cyprus hotel. Book our all-inclusive deals and leave your wallet at home! The Merit Crystal Cove Hotel sets the standard for other North Cyprus 5 star hotels, with a winning combination of a modern hotel with good old fashioned 'attention to detail' customer service. Nothing is too much trouble for the staff at this international hotel. 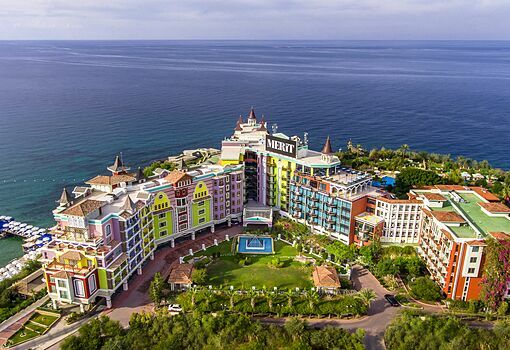 Set right on the water's edge, with its own secluded sandy cove, and with lots of activities, live events and spectacular buffet dining to enjoy, the Merit Crystal Cove Hotel is 5 star in every way. 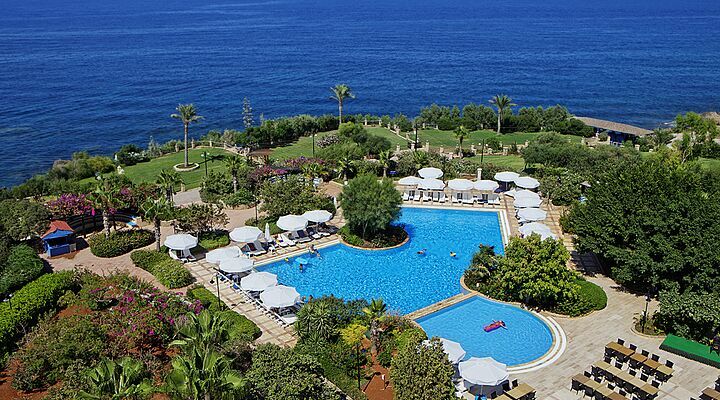 At the Merit Crystal Cove Hotel, the sparkling Mediterranean Sea is just at the end of the hotel’s immaculate gardens. Stroll down to the immaculate lawn terraces set above the beach complete with day beds in shady pergolas, or the most comfortable luxury hammocks you'll ever snooze in. Dig your toes into the soft sand of the hotel's own private beach shielded from winds and tides and under the protective gaze of the lifeguard during the summer. 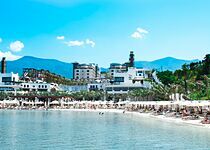 There's sun loungers to stretch out on, a beach towel service, shallow safe waters to swim or paddle in, and a range of watersports if you fancy some serious fun on the sea. 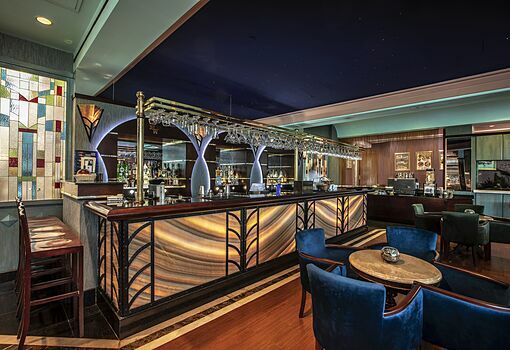 The beach bar will serve you cooling drinks and superb snacks all day long too. Our GNC team loves the swimming pool at the Merit Crystal Cove Hotel, with its rich planting and curved design that makes it feel as if you're swimming in a garden! With lots of sun loungers and a large separate terraced area for dining, the Merit pool is a lovely area to spend time in. 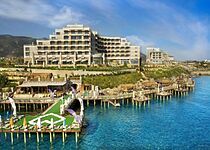 It sometimes feels like all inclusive hotel deals in North Cyprus exclude more than they include - not so at the Merit Crystal Cove Hotel. During high season they offer Ultra All Inclusive. 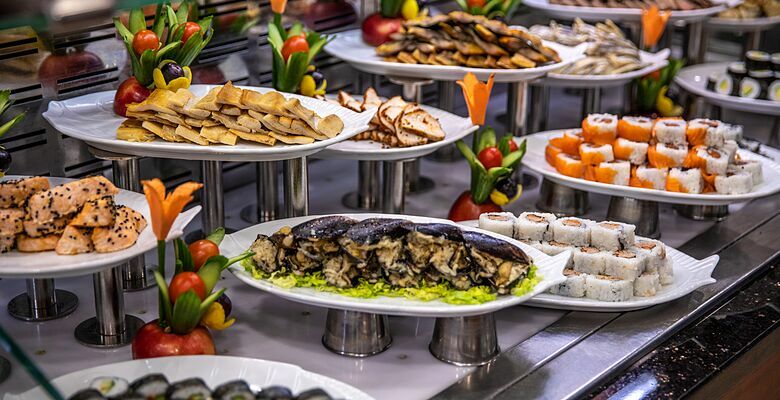 Impeccable culinary tastes that will have you experiencing Merits Turkish and International flavours that will have you experiencing Merit's hospitality. 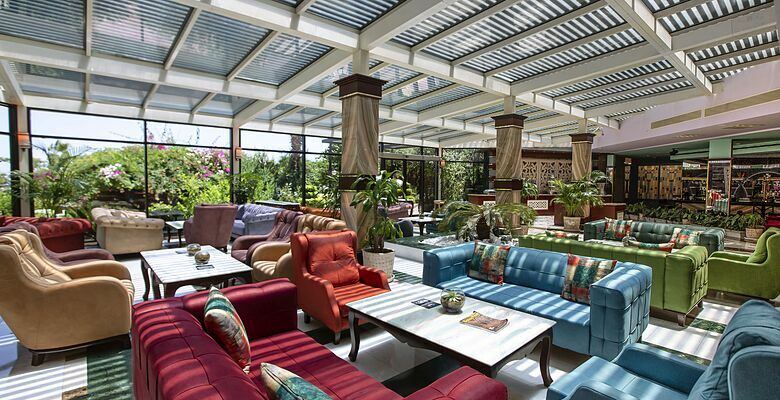 There's hardly an hour of the day or night when you can't enjoy some of North Cyprus's best cuisine at the Merit Crystal Cove Hotel. The buffet dining in the Crystal Restaurant offers a vast range of dishes, many made with local produce and organic vegetables. The Hasir restaurant on the beach serves a village style 'rustic' breakfast during the summer, complete with home-made jams, comb honey and fresh bread from the oven. At night it transforms into the Lambusa restaurant, serving fresh fish and seafood within earshot of the waves. For amazing views with your meal, head for the Panorama Restaurant on the sixth floor of the hotel, where the food is as amazing as the view. 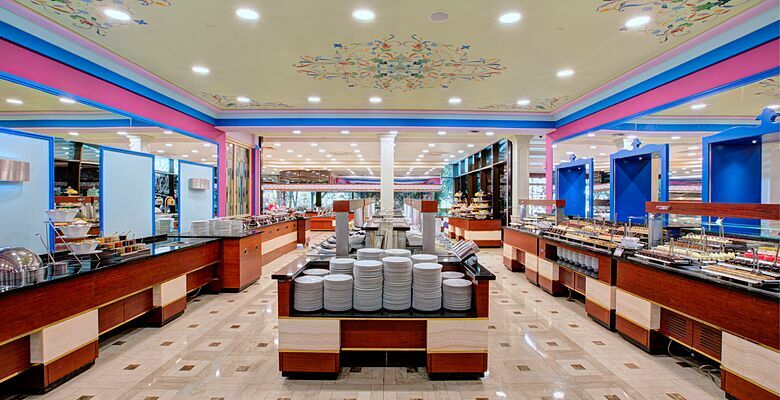 Opt for the fun of creating your own kebab at the Ottoman Kebab House, complete with authentic tiled decor, or enjoy fine dining in the hotel casino. At the Merit Crystal Cove Hotel, the bedrooms have lots of space, and sleek bathrooms fitted with cooling Italian marble. Every room is kept at just the right temperature with efficient air conditioning, so you can relax and watch the satellite TV, admire the view through the large windows, or lie back with a drink from the mini bar after a hard day's relaxing in the Cyprus sun! 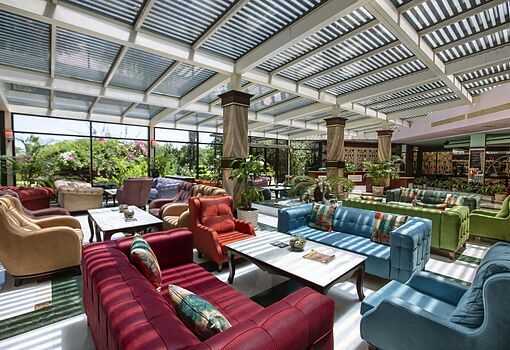 Adjoining/interconnected and accessible rooms are available to accommodate your specific needs. 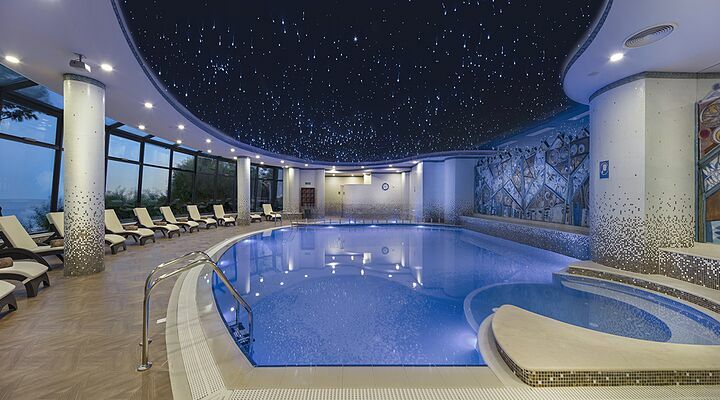 Spa and Wellness Centre with Snow Room! 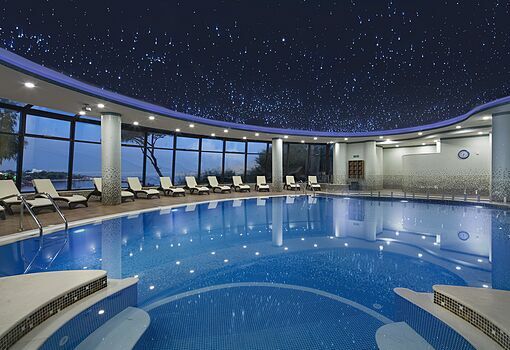 Make time to experience the Merit Crystal Cove Hotel spa and wellness centre. 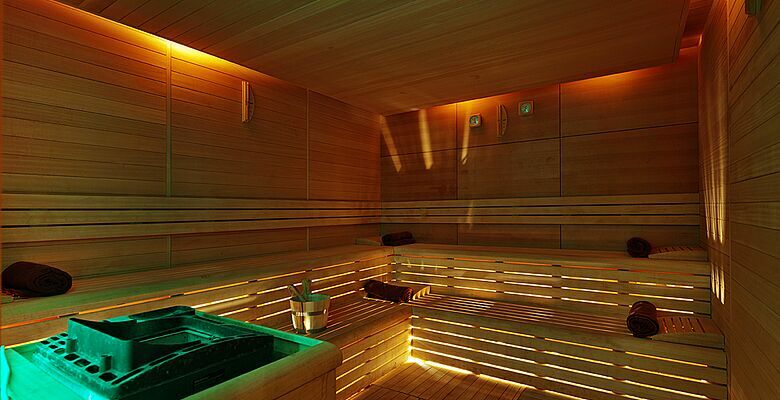 Heat up in the sauna, relax in the stream room and chat in the traditional Turkish bath. Experience the 'adventure shower', then cool down in the amazing snow room/ice cave. Pamper yourself with a hot stone, Balinese or Shiatsu massage. 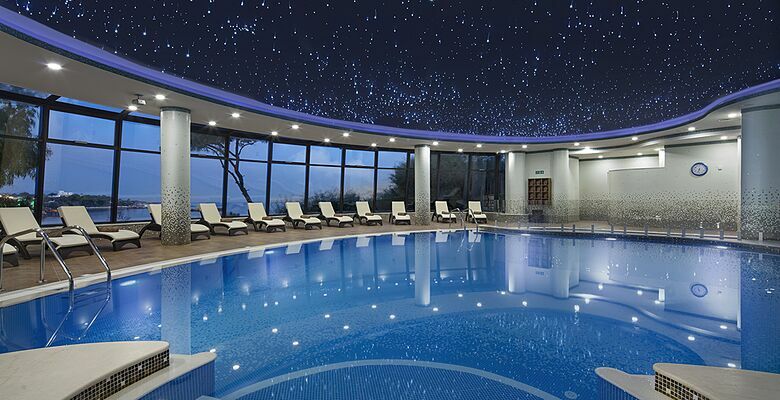 Choose an indulgent beauty treatment including collagen facial treatments, skin masks and mud envelopment treatments. Work out in the Merit Crystal Cove gym, with its wide range of the latest gym machines, or challenge other guests on the tennis courts, basketball court, and beach volleyball field. 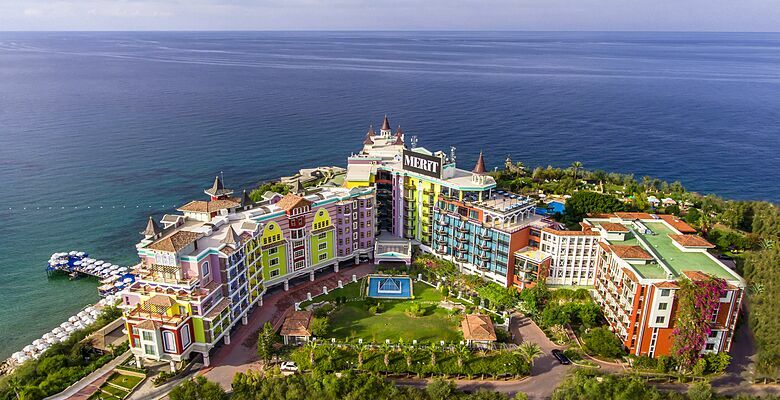 The Merit Crystal Cove Hotel is very welcoming to children, and has two kids' clubs to keep them entertained. There's a separate children's swimming pool, play area, a diving school with lessons for young beginners, and for horse-mad kids, there's even a pony club (charges may apply). 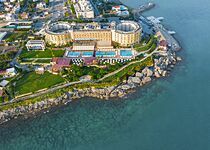 In the evenings, the hotel stages shows and concerts by celebrity performers from Turkey, offering you a taste of music and entertainment that's quite different and absolutely world class. The international stars of the WPT come here to play the "Thinking man's game" Texas Hold' Em, but you can enjoy the gaming tables, slots and extraordinary atmosphere anytime in the hotel's glittering casino. Fly to North Cyprus Ercan Airport and enjoy remarkably short transfer times to the Merit Crystal Cove Hotel. When you book a package holiday you can sit back in your air-conditioned transfer taxi while other tourists are climbing onto a bus, and you'll be checking in to your room in around 40 minutes!